Lymphocytes. 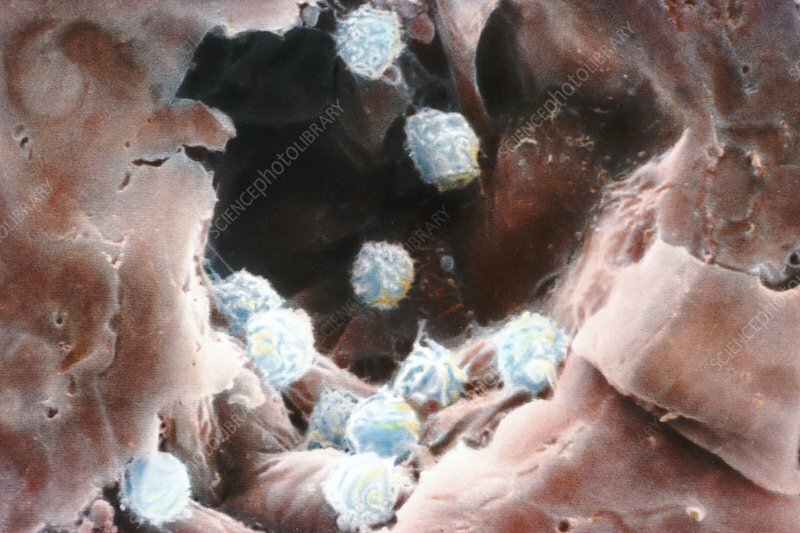 Coloured scanning electron micrograph (SEM) of lymphocytes (white blood cells) seen in a small vein. Here, lymphocytes are coloured blue; they are adhering to endothelial cells which line the blood vessel. Lymphocytes are involved in the body's immune response. Two main types of lympho- cytes occur in the human body: T-cells & B-cells. T-cells (thymus-derived) take part in a cell- mediated response, tracking down and destroying antigens directly (as killer T-cells). B-cells (bone marrow derived) take part in the humoral immune response by identifying foreign antigens and then producing antibodies.